Celebrate the Canyon with sage, cedarwood, and bergamot in our gorgeous soap colored with skin-purifying clays and kissed with desert jojoba oil. Created to mirror the sedimentary layers of the Grand Canyon, our masterpiece four-layer soap celebrates one of the Seven Natural Wonders of the World, and the crown jewel of Arizona. 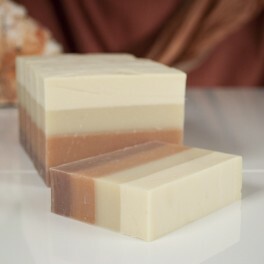 Colored with four different all natural earthen clays and scented with our original 100% natural essential oil blend Wild Women’s Grand Canyon soap will invigorate and inspire. Formulated with skin-loving plant oils of jojoba, olive, coconut and palm, this soap is very gentle and highly moisturizing, plus Grand Canyon’s clay-enhanced silky lather is a wonderful facial soap and perfect for shaving. Ingredients: olive oil, coconut oil, distilled water, palm oil, jojoba oil, sodium hydroxide, castor bean oil, fragrance, terracotta clay, Moroccan red clay, multani mitti clay, china clay and vitamin E oil. 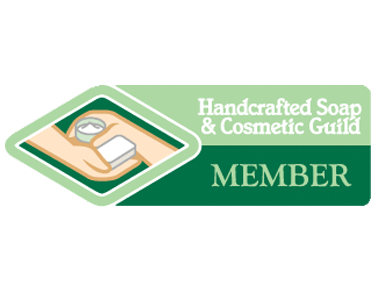 Soaps are sold individually as wrapped bars, or save money with our unwrapped naked-stacks of 5 or more cut bars, or save even more with a full uncut soap log (17+ bars of 1” wide soap), cut whatever size soap you’d like and enjoy! Please note: uncut soap logs ship 7-10 days from ordering. Wild Women Soaps are 4.5 oz. (approx.) and hand cut, please enjoy the slight variance in size and shape. Extend the life of hand-made soap by storing in a well draining dish. Check out our Wild Women Soap Decks!